Those proud members of the U.S. Army are individuals cut from steel, born to serve this great nation with pride and determination. 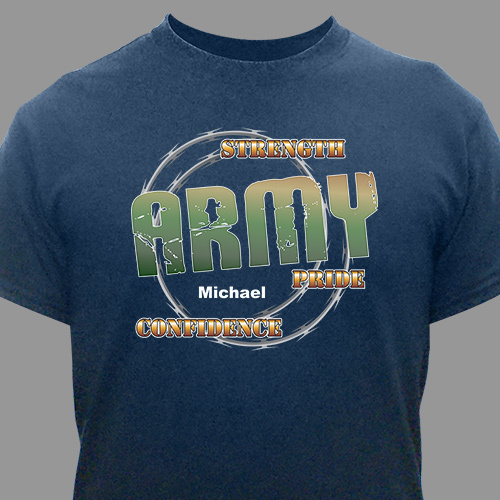 Show your pride in the United States Army with one of these cool Army Personalized T-shirts. A handsome welcome home gift for your favorite Soldier or give one to everyone in the family celebrating the safe return of your strong Soldier. Our Army Personalized Shirt is available on our premium pre-shrunk 100% cotton Black Personalized T-shirt, machine washable in adult sizes S-3XL and makes a great gift for Veteran's Day or Welcome Home celebration Your Army Shirt includes FREE personalization! hubby retired from the ARMY..this is a GREAT shirt.. love it. GiftsForYouNow.com has many unique and stylish Personalized Military Gifts & Apparel suitable for Welcome Home Gifts, Patriotic Gifts and Personalized Veteran Keepsakes. Shop GiftsForYouNow.com for all your Unique Military Gifts today and show off your pride in this great nation.